Cheerwine: a legend 100 years in the making. Cheerwine is produced by the Carolina Beverage Corporation, founded in 1917 in Salisbury, NC by a general store owner named LD Peeler. Peeler first began distributing a soft drink called Mint Cola. During a World War I sugar shortage, he began experimenting with other flavors, eventually developing Cheerwine. Today Cheerwine is the primary beverage sold by the company. The company is still based in Salisbury and is privately owned and managed by the same founding family, five generations of whom have worked there. 2017 marks the 100th anniversary of Cheerwine! During the twentieth century, Cheerwine became an important part of Carolina culture. The family business continued to succeed throughout difficult eras in American history, including The Great Depression and World War II. 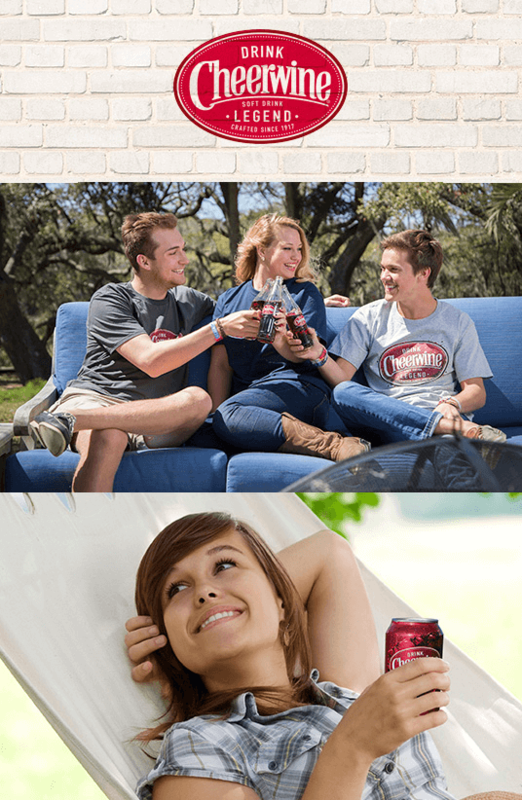 The 21st century has been an exciting one for Cheerwine. The company has broadened their distribution area to include several new states, and released new product offerings such as Cheerwine Squeeze, Cheerwine Holiday Punch and Cheerwine Kreme. While much has changed around Cheerwine over the last hundred years, the taste and authenticity of Cheerwine itself has not changed.